namo bhagavate bhaiśajyaguru vaidūryaprabhar&amacr;j&amacr;ya tath&amacr;gat&amacr;ya arhate samyaksambuddh&amacr;ya tadyath&amacr;: oṃ bhaiśajye bhaiśajye bhaiśajya-samudgate sv&amacr;h&amacr;. (tadyath&amacr;:) oṃ bhaiśajye bhaiśajye mah&amacr;bhaiśajye bhaiśajyar&amacr;je samudgate sv&amacr;h&amacr;. The short form of the mantra could roughly be translated as “Hail! Appear, O Healer, O Healer, O Great Healer, O King of Healing!” The optional “tadyath&amacr;” at the beginning means “thus,” and it’s not really part of the mantra, but more of an introduction. (Tibetan is from an entirely different language group from Sanskrit, and so it’s even harder for Tibetans to approximate Sanskrit pronunciations than it is for English speakers). Bhaiśajyaguru is one of a set of eight healing Buddhas, which includes Shakyamuni, the historical Buddha. Bhaiśajyaguru is the head Buddha of the group. He is Lapis Lazuli blue in color, although sometimes he’s depicted as golden-skinned. He is dressed in the robes of a bhikśu (monk). His left hand rests in his lap in the mudra (hand gesture) of meditation, while in his right hand, held palm upwards at the right knee, he holds a branch of the healing myrobalan plant. In his left hand, which rests in his lap in the dhyana (meditation) mudra, he holds a bowl of amrita — the nectar of immortality. The idea of the Buddha as healer goes back — as a metaphor — to the days of the historical Buddha. It’s said, in fact, that the formula of the Four Noble Truths is based on a medical model of diagnosis, etiology, prognosis, and therapy. The Buddha demonstrates in the historical teachings a good knowledge of anatomy and physiology, at least by the standards of his time, and although he almost certainly wasn’t trained in the medical arts he seems to have had some knowledge of them. In Tibetan pronunciation “sv&amacr;h&amacr;” becomes “soha.” This is technically incorrect from a Sanskrit point of view, but it also has many centuries of tradition behind it, and in any event few Westerners pronounce Sanskrit correctly either! Still, outside of the Tibetan tradition it’s probably best to revert to the best approximation possible of the Sanskrit, where both a’s are long (as in father), and the v comes close to being an English “w” sound. The following essay, written by Srivandana, was originally published in Dharma Life magazine, and is reprinted here by generous permission of the author. My connection with Bhaiśajyaguru, the Medicine Buddha, goes back many years. Sometimes it feels as though he has been there all my life, waiting for my emergence as a Buddhist, but there was also a natural evolution of the connection. From an early age my life has been marked by ill health, and this seems to have increased as time has gone on. The challenge has been to make sense of this, without being overwhelmed by the sensations of physical and mental pain; to live with the adversity but not to be consumed by it. In the course of my working life I moved from the superficiality of the “rag trade” (the fashion industry) into the caring professions, and ultimately trained as an art therapist. Working in art therapy meant I could use both my love of art and my desire to help people make sense of the huge range of emotional experiences and responses that characterize life. I wondered, though, where the “spiritual” fitted in with the analytical approach I took in my work. by Raoul Birnbaum, which introduced me to a Buddha of whom I had never heard. My response was immediate: an enormous sense of excitement and relief that this Buddha existed within the vast pantheon of Buddhist deities. My teacher, Sangharakshita, told me he had a painting of the Medicine Buddha that had been given to him when he lived in India. He kindly had it photographed, and a copy was sent to me — the first of many images I was to collect. I fostered this feeling for Bhaisajyaguru as I wanted to be physically and spiritually healed and, more importantly, I wanted to heal others. In 1989 I wrote to Dhardo Rimpoche, one of Sangharakshita’s Tibetan teachers, and told him about my interest in and feeling for the Medicine Buddha. I see now that I was looking for “lineage.” I wanted to hear about the Buddha I had come to love from one of my teacher’s teachers. Dhardo Rimpoche replied, saying he appreciated my work as an art therapist, and that healing people in this way would be a great service if I could do it with an open heart. He believed the Medicine Buddha practice would be a great help to me in my work, and said that Tibetan doctors focus on devotion to the Medicine Buddha as well as prescribing medicines. Perhaps a month after I received this letter, I awoke with a start. Something seemed to propel me from my bed and on to my meditation chair. I closed my eyes and immediately saw in my mind’s eye a dazzlingly clear image of Dhardo Rimpoche, clad in everyday robes. He was smiling, his gaze clear, direct and compassionate. Slowly behind him an image formed of a blue Buddha, the form of Bhaiśajyaguru. Dhardo Rimpoche continued to look towards me with his gentle yet strong face. Gradually the body of Bhaiśajyaguru merged with that of his, as he faded or perhaps became Bhaiśajyaguru. It was an overwhelmingly beautiful experience, which reduced me to tears. I heard a short time later that Dhardo Rimpoche had died on that very day. I was ordained into the Western Buddhist Order in 1993, and leaped into a new phase of my relationship with Bhaiśajyaguru through taking up his sadhana, a meditation practice focusing upon him. This took our relationship into the realm of visualization, symbol and imagination. Homage to Bhaiśajyaguru, Master of Healing. Lapis Lazuli Radiance Tathagata! Clear blue space, blue as the sky on a summer’s day, the bright azure blue where white cliff meets sky. Clear blue space above, below, in front, behind, sweeping round. The space that contains all things and to which all things are reducible; the space that transcends time, the space in which all is stripped away, all is still, all is silent. It is a space that is empty yet full of potential, in which all things are possible; a space that is neither hot nor cold; a space of refinement in which only the beautiful can appear. This is the space in which Bhaiśajyaguru, Master of Healing, will appear if the request is made, if our devotion is absolute, our motive pure and our desire wholehearted. White. A shimmering, sun-dazzling white lotus appears, perfectly poised, as if suspended in clear blue space. White-heat, petals strong and upright, embodying an integrated male awareness. White so bright that eyes cannot remain fully open, cannot truly see its glory. Soft, quietly glowing, a moon-white mat rests in the calyx of the lotus. The moon is fully integrated femininity, standing by herself, aloof, fearless, noble. She forms a round, whole mat to receive him, ever open to him. There is the unity of the lotus and moon mat, the masculine, the feminine, that prepare to meet him. A perfectly formed hand appears, a strong foot, a figure seated in meditation. An overwhelming sense of compassion that brings tears to my eyes. Royal blue eyes set in a beautiful, blue beneficent face. He appears through the blue that transcends space and time. He is deep blue, the color of the finest lapis lazuli. He has a mature male form possessing all the major and minor marks of a Buddha: his deep indigo hair, the indigo curl between his eyebrows, the top-knot surmounting his head, his finely formed limbs — each mark a sign of perfection. He wears saffron robes, this perfect one, this dweller in the sublime abodes. He holds his left hand as if in meditation, the fingers gently supporting a begging bowl formed from gold-traced lapis lazuli. It contains something mysterious that has the taste of freedom: amrita, sacred nectar. His right arm stretches downwards, the hand turned outwards in the gesture of giving. In his palm he holds the healing yet bitter-tasting myrobalan fruit, attached to leaves and twigs from its mother tree. I wonder how many hours I have spent lying on my bed contemplating the significance of Bhaiśajyaguru. How many hours have I spent gazing at his form – that strong, expansive blue chest – pondering the significance of the myrobalan and the begging bowl with its amrita, the nectar of immortality? Myrobalan is used widely in both Indian and Tibetan medicine. But what exactly is he offering, and why does there appear to be such strength in his right arm, which holds something so mundane? My quest for healing is slow, taken step by step, but each step produces further clarity and refinement of my views. I have raged against the certain knowledge that there is no physical healing for me in this lifetime. My body is marked by the characteristics of existence — it is impermanent and unsatisfactory and insubstantial. But “mind” is another matter. Mind has potential. I can change how I view and respond to both inner and outer worlds. I do not have to be bound in future lifetimes by the limitations I have brought with me or have created in this life. So what does Bhaiśajyaguru want me to do? The answer is so simple, so obvious, yet so unpalatable. “Take the medicine, Srivandana!” He would like all of us to take the medicine – if we dare! Medicine tastes nasty and the myrobalan tastes bitter. But if we want to be healed we have to take action, even if that action is difficult and the results are even more so. Imagine being confronted with a bottle labeled “Medicine — Drink Me.” The appearance of the liquid inside the bottle produces a strong feeling of aversion. But if you know that it is the essence of the great beauty and compassion of Bhaiśajyaguru , if you can see it with the right eyes, the liquid shimmers a lustrous blue. As you remove the cork, a putrid smell assails your nostrils. Perhaps you retch. Yet is there not also the scent of jasmine on a hot summer’s night? Summoning up your courage, you dip a finger into the liquid and taste a drop. Your face screws up in protest. It tastes of everything you do not want to taste. Your stomach recoils, your system rebels. But after a while there comes a sense of ease, release, excitement, joy and — greatest of all — understanding. The law of impermanence is the most beautiful thing I can possibly imagine. I have made a practice of contemplating impermanence and recognizing that everything is insubstantial and therefore painful and unsatisfactory. Reflecting on impermanence, allowing it to permeate every pore, every particle of my consciousness, rocks me to the core of my being. I feel as though I have been turned inside-out. Yet the law of impermanence is full of potential and is permeated by the beauty of change. The knowledge that this change lies in my hands, and that I can take responsibility for its coming into being, is hugely empowering. The medicine of the Dharma has to be drunk by the gallon, bathed in, fully absorbed. The vast sea of Dharma stretches into the distance, but a single drop can go a long way. Bhaiśajyaguru also points out the danger of finding oneself in a void of impermanence, without beauty and without sustenance. I need the beauty that I touch through making art and listening to music, through communicating with spiritual friends; as well as the sustenance gained from meditation, in particular meditation on the sublime abodes of positive emotion, or brahmaviharas. In the Sutra on the Merits of the Fundamental Vows of the Master of Healing Tathagata, Manjusri, the Bodhisattva of Wisdom, recites the 12 great vows which the Bodhisattva Medicine King made before he attained Buddhahood. One section of the sutra is entitled The Importance of Faith. Faith comes into being at the point where knowledge meets experience. If we choose to accept the gift that Bhaiśajyaguru offers, we naturally experience a genuine desire to acknowledge his compassion and generosity, and in doing so we deepen our faith. This gratitude can be expressed through the earnest practice of meditation, through recitation of his mantra, and through ritual worship dedicated to the healing of all living beings. In such a ceremony seven images of Bhaiśajyaguru adorn a seven-tiered mandala, and 49 butter lamps are placed before them. A sand mandala is created alongside the three-dimensional mandala. Imagine the colors and sounds of sutra reading and chanting, the depth of practice, this immersion in devotion, which continues for seven days. An important part of my own devotion to Bhaiśajyaguru takes place at the end of the sadhana when I perform a “healing mala.” Each bead on my mala is dedicated to someone whom I know is experiencing difficulties, and I ask Bhaiśajyaguru to make them all whole. Some years ago there was a phase when I felt I had entered a bleak state of aloneness, in which I was haunted by dark images of beings sent to annihilate me, twin harpies wishing to devour my being. When this phase reached a peak of intensity, I was faced with a long night, which seemed pitch-black on many levels. I struggled with the desire to flee, and the fear of truly taking the medicine that was held out to me. I offered light to Bhaiśajyaguru. I wanted to survive this experience of suffering, but also to understand it. In this void of psychological suffering, the sustaining force was faith. At dawn I recognized I had passed through a metaphysical gateway, and formed a strong bond with Bhaiśajyaguru, my friend, my most passionate and skilled lover, my spiritual guide, my link with the transcendental. A deeper devotion emerged, an absolute conviction in the “rightness” of our liaison. I was learning to dive deep into the dangerous areas of the psyche, to investigate with mindfulness the mental states I found there and to offer them to Bhaiśajyaguru. I began to see that truly to revere Bhaiśajyaguru is to have cleared away the dark veils of spiritual ignorance and to see with the eye of wisdom. I feel such tremendous gratitude to him that I only aim to worship him more and more, and thereby become him more and more; I want to wrap myself in a cloak of blue and, donning winged boots, kick off into his blue sky, scattering traces of gold, which gently fall as Dharma rain. Srivandana was ordained into the Western Buddhist Order in 1993 and is devoted to ever deepening her relationship with Bhaiśajyaguru, the Medicine Buddha. She has experienced this relationship both from a position of relative good health to one of poor health and recognizes that the only true medicine to be found comes from a bottle labeled “The Dharma.” Srivandana lives alone save for 3 feline campanions. Hi Bodhipakśa. This new page looks good. The translation of the Medicine Buddha Sutra that I am familiar with and whence comes this mantra says in a note that the “long version” is not the dharani, only oṃ… …sv&amacr;h&amacr;. I think the term for the introductiory part might be mangalagatha. However the text itself doesn’t seem to make a distinction. I’m wondering about including the long version on visiblemantra – what do you think? Thanks. The note you’re talking about would be the one in the Medicine Buddha Sutra, which I was actually reading just as your comment came in. I’d agree that the “long” version includes what’s effectively an introduction. The game’s given away by the fact that the intro ends with “thus:” It’s rather anomalous that the “thus” sometimes gets chanted as part of the short mantra. I think it would be great if you included the long version on VM – especially if you could figure out the grammar. What’s with all the “e” endings? Actually this applies to the short version as well. In the FWBO the endings in this mantra are always “a” (an anomaly I forgot to point out, given that Srivandana uses the “a” declension). I get the sense that this mantra is not grammatically sound. What do you make of it? Sorry for the disjointed comment — my wee girl woke up way too early this morning and I’m severely sleep-deprived. I can only think in disjointed fragments! I’ve see a number of explanations of the -e ending and they all seem to be ad hoc. Some people (Conze, Kern) see them as feminine vocatives of nouns in -a (this would include participles such as ‘gata’ which are declined like nouns in -a). The -e words are, in this view, invocations of feminine deities – gate = “O (she who is) gone”. It works in some ways and not in others. Actually it seems quite weird now I think about it. I was sparked by your question, and having been reading about the language of Aśoka recently, to explore the idea that they are legacies from Prakrit which, in M&amacr;gadha, had the nom sg. in -e. I’m writing a blog post on it which needs some more research. I’m relieved it’s not just me who’s confused. I’d wondered if the -e was a dative form, which it is in some cases, like arhate, so it might be “hail to Bhaisaja.” Not that that would be grammatically correct in Sanskrit, but as you say there might have been an importation from some form of Prakrit. Anyway, I’m looking forward to your blog post. Incidentally, Srivandana tells me that in Raoul Birnbaum’s The Healing Buddha the mantra is given with the -a form. I haven’t read or even seen the book. Unfortunately Amazon doesn’t have a “look inside the book” feature for it and on Google Books the search feature is very limited. it does wow me whenever i read buddhists made Buddhism sound so beautiful. same here when i read srivandana’s article on Medicine Buddha. the only sutra i have read about Medicine Buddha is the sutra in Chinese Buddhism – the Sutra on the Merits of the Fundamental Vows of the Master of Healing Tathagata. srividana made the practice of Medicine Buddha (based on Vajrayana’s practice) sound very beautiful, sometimes poetic; if one were to read only this sutra, one only learns about the merits of reciting the Medicine Buddha’s name or the only included long version dharani as well as some straight teachings about kamma. i do recommend everyone who has interest in learning the Medicine Buddha’s practices to have a wider range of sources, especially from both Vajrayana and East Asian Buddhism, so that one can maximise the benefits from the practice. p.s. 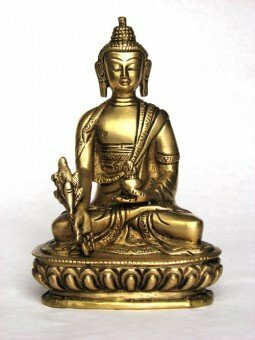 to srivandana, in the Sutra on the Merits of the Fundamental Vows of the Master of Healing Tathagata, Manjusri Bodhisattva did not recite the 12 great vows of Medicine Buddha. he only requested Shakyamuni Buddha to talk about Medicine Buddha and his great vows and the merits of his practices for our benefits. it is Shakyamuni Buddha who preached the 12 great vows of Medicine Buddha. Also if srivandana is refering to the above sutra, there is no section entitled “the importance of faith”. the sutra itself does not have any divided sections, unlike the Diamond Sutra. the whole sutra is one whole sermon on faith in Medicine Buddha. You’re right about it having been Shakyamuni who expounded the vows at Manjushri’s request. As for divided sections, it seems that Srivandana is going by Hsuan-tsang’s translation, which is divided into chapters, one of which is “The Importance of Faith.” The sutra is available here (PDF). hi bodhipaksa, it seems that the divided sections may have been done by BDEA, because i’m reading the sutra translated by master Hsuan-tsang and i’m quite certain there are no divided chapters in the version itself. most of east asian buddhists (especially chinese buddhists, including myself) who have read the Medicine Buddha sutra are reading the Hsuan Tsang’s translated version. on the other hand, if you can refer to vajrayana tipitaka, you may find this sutra to be one of the chapter of the sutra of 7 Medicine Buddhas (tibetan version). Dear Srivandana: My understanding of the Medicine Buddha Sutra is that you cannot focus only on the mantra and devotion. “Worshipping” may not get any bonus points, and may even miss the point. There are many requirements to succeed in a healing, which includes releasing 49 species of animals and observing the 8 precepts. You call this Buddha your most passionate and skilled lover. Isn’t that a misrepresentation of what the Buddha teaches? He teaches to let go of passion, as it is a cause of suffering. Saving animals from death may help to eliminate some karma. When people eat meat or consume dairy, they indirectly create much more killing. When people are vegan, they create less demand for killing. So much disease is caused and can be lessened through diet. By releasing the animals, you show to the Buddhas and divine intelligence that you are a friend to all and that you care for all sentient beings. When that happens, it is easier for these beings to help you, because they care about all the animals and all the suffering sentient beings. It won’t be fair for them to help you if you are part of the global problem. The Medicine Buddha sutra explains the great power of the Tathagatas. My understanding is that if you follow the rules, you will change and then it is easier for them to help you. Just my understanding. The Buddha doesn’t encourage us to let go of passion, but to let go of greed, hatred, and delusion. These are sometimes called “the passions” but that’s not to say that strong emotions of love and compassion are discouraged. The word “passion” in this sense means “uncontrolled emotions” or even “emotions that lead to suffering” (the origin of the word “passion” is a Latin word meaning “suffering.” Buddhism in fact encourages us to cultivate a love for beings that is as strong as “a mother’s love for her only child” (see the Karaniya Metta Sutta). Sometimes you will hear a story told of a hermit who was pronouncing his mantra wrong, and a travelling Lama called to see him. The Lama corrects the hermit and goes off on his travels. But as he leaves he hears the hermit calling him, and sees him running across the surface of a lake to ask again about the ‘correct’ pronunciation. The moral of course being that pronunciation doesn’t maketh the saint. Funnily enough Donald Lopez, in Prisoners of Shangrila, has pointed out that this story was in fact told by Tolstoy at the end of the 19th century (read The Three Hermits online). It was a Russian folktale told about three Christian hermits. How did it come to be a Buddhist, and indeed Tibetan, story? My guess is that it was quoted in The Autobiography of a Yogi (p.309) by Paramhansa Yogananda, first published 1946, and from there into Buddhist circles via enthusiastic yogis. Thank you for this most inspiring and personally touching teaching and for sharing your connection and understanding of the Medicine Buddha. I searched in many places for something which would clarify and open the mantra for me and your piece really does this. https://youtu.be/yUJucA-mrgE is a youtube clip of the Mantra chanted by Khenpo Pema Chopel Rinpoche from the CD ‘The Blessing from H.H. Penor Rinpoche for World Peace’. This is very beautiful and good timing as i am painting my first Medicine Buddha, thank you so much for sharing. There is a link to an mp3 file of the pronunciation of the Bhaisajyaguru Mantra on this page. It may be a problem with my browser but I can’t get the link to work. If you have time can you take a look at it. I’d love to get clarity on how to pronounce the mantra. Whether you can or not – much appreciation for these online resources and discussions. Hi, Nandaketu. The link should work now. Apologies for the glitch, but we’ve had problems with the various audio plugins that we’ve used. They’ll work for a while and then mysteriously cease functioning. From a Native American understanding of these words concerning my position and perspective (perspective is important) is understood in this way: “I offer my respects and gratitudes to the original teacher and to our leaders and masters of healing; to the blue healing light (to a native this dark blue light is an ancient feminine or grandmother healing light) and to the healing/purifying white light (to us is represented by the white bear and is different to each tribe but always a representation of white healing light and is masculine energy.. The male and female energies together create life and open us to enlightenment or deeper understanding of the creative energies which are healing by simply being); to the one who is in a position to understand perspective beyond ours, please appear oh great healer, oh original master of healing.” I am not in a position to interpret perhaps from a Tibetan perspective or a Westener’s perspective. I can only understand from where I am but I believe it is irrelevant sense we are not in a position to know “truth” but only to attain a perspective of enlightenment or empowerment. I’m sure my words are wrong and I am having trouble explaining the concept I’m feeling but I think or hope I am getting a helpful meaning out of what I am hearing from you. I was just re-reading the article I originally wrote in 1993 and which then appeared on Wildmind in 2009, as I have been asked to give a talk on Bhaishajyaguru next month. It’s a fascinating read for me as when I wrote it I was very recently ordained and ‘on fire’ as it were! Now, almost twenty-one years later, there is a greater spiritual maturity – well I hope there is! I’m looking forward to seeing what and how ‘things’ emerge in the talk. Thank you to those of you who made kind comments, they are much appreciated. Can anyone give the names of the 7 Medicine Buddha’s please. I know Bhaisajyaguru is one and Gauthama Buddha is among them along with Guru Bhaisajyauru. I do like to dedicate a LAMP (24 hour Lamp) to all forms of medicine Buddha’s. I am now in the process of dedicating for 28 past Buddhas… Starting from Tanhamkaro…. finally Guauthama Buddha. Much appreciated if I get all names with correct spellings as I emboss the names in all lamps with a PALI CHANT of DHAMMAPADA…. thank you for sharing all this. i just love the medicine buddha image on this page. where can i find it? thank you! I’m not sure, Kasha. I may have taken the photograph myself. Is an audio available anywhere containing the Tibetan pronunciations of both the short and long versions of the Medicine Buddha mantra? In particular, I am seeking ones in which those mantras are said slowly. Did you translate “samudgate”? I cannot find it. samudgam sam-ud-gam, cl. 1. P. -gacchati, -gantum, to go up or rise together; to rise up, ascend; to come forth, break forth, issue, exude. I am thinking that samudgate would derive from this verb. What is not clear to me is which of the meanings is intended in this mantra.